Which plays are in Early Modern English Drama (EMED)? Where is Shakespeare? And how does this relate to him? What kinds of plays are these? How do I read a play? What is a “play entry”? What does a play entry look like? Do you have suggestions for teaching with EMED? Can I have your data? What else does EMED offer? Early Modern English Drama (EMED) includes 403 plays, none of which are currently attributed to William Shakespeare. EMED plays were first performed in London from 1576 to 1642. The plays span the era from the opening of the first purpose-built theater in London, the Theatre, to the closing of the theaters in 1642 during the English Civil War. To be included in EMED, the play had to be printed before 1660, and a copy from that early printing has to exist today. EMED provides searchable descriptions (metadata) for all 403 plays and full texts of several dozen. To see the list of all 403 plays, search on the home or Advanced Search pages while leaving the search boxes blank. To see the full texts, go to Featured Plays. EMED does not fully represent the wider world of early modern dramatic entertainments. For instance, we excluded plays for which there is no strong evidence of professional performance, plays that were unfinished, plays only performed by students at the universities or Inns of Court, and masques and tilts performed at court. Other resources exist to explore this wider scene, especially the Database of Early English Plays (DEEP), which includes editions beyond the first, or the Visualizing English Print Project’s Early Modern Drama corpus. William Shakespeare’s plays are not part of EMED, for a simple reason: EMED was conceived as a way of showcasing all of the other playwrights writing in England’s early modern era. By bringing together their plays, however, EMED recreates the theater world that made possible Shakespeare’s career and influenced his work. Shakespeare knew many of the earlier plays as an actor or audience member. He also collaborated and competed with some of the playwrights. He directly influenced others. To read Shakespeare’s works, we recommend another Folger resource: the Folger Digital Texts. The plays in EMED each have their own story. Some fall into the same genres as Shakespeare’s works, like the tragedies; others are from genres not fully represented in Shakespeare, such as pastoral plays. Many are anonymous. Altogether, a wide variety of playwrights are represented, including some who are still remembered today, like Christopher Marlowe and Ben Jonson, and many who are not. EMED includes popular, innovative, and controversial plays, such as Thomas Kyd’s The Spanish Tragedy, Francis Beaumont’s The Knight of the Burning Pestle, and Thomas Middleton’s A Game at Chess. You can read the full text documentary editions of EMED’s featured plays online, or download the texts to read them in PDF in original or regularized spelling. The plays are easily accessible from the Featured Plays page, and they are being released in batches, as our project’s work continues. Click the Read button on the left to read the play online, or choose from options on the right to download it in HTML, XML, or regularized PDF. Each available featured play may also be accessed from its play entry. Click the Read button to read it online, or download original or regularized (i.e., one step towards modernized) spelling PDFs from the Versions bar. The Versions sidebar on EMED play entries also provide links to open-access scholarly editions. Please get in touch if you know of a freely available edition that should be linked. 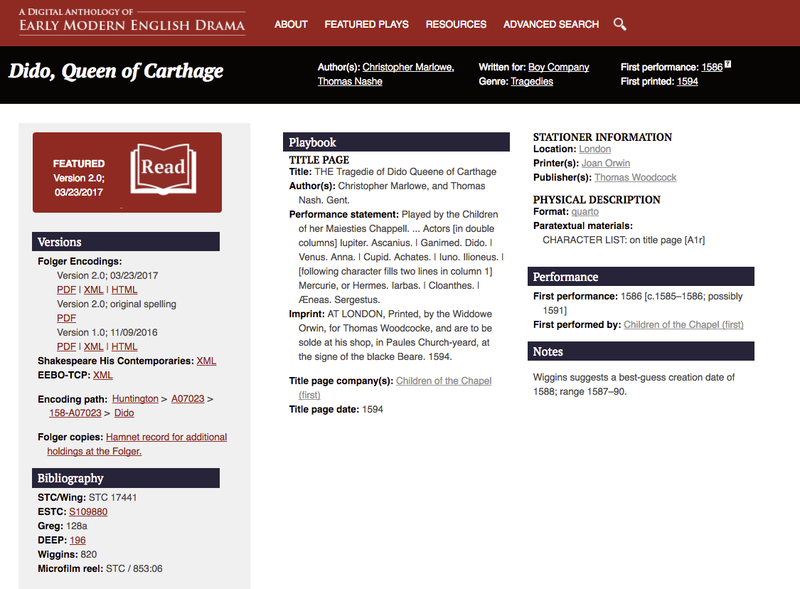 If you are interested in reading a play that is not yet available in an EMED documentary edition, you can access many of these plays as Early English Books Online-Text Creation Partnership (EEBO-TCP) transcriptions on the University of Oxford Text Archive (OTA) or transcriptions on the Shakespeare His Contemporaries (SHC) site. These transcriptions have not been thoroughly proofread and may have missing or inaccurate text. EMED’s featured plays are documentary editions. A documentary edition is a representation of a single item. To put it another way, each one is based on a single print witness or copy of the play in question, meaning that it retains the original spelling and messy textuality specific to that individual print copy. Each EMED text and its record represent the earliest extant edition of a given play. Unlike critical editions, EMED texts have not been collated or compared with other copies of the same edition nor with copies of subsequent editions. Nor have we provided explanatory notes or introductions, the way scholarly editors do. That is work that others may undertake, using our transparent and reliable texts. For more information about documentary editions and our editorial practices, see our Editing page in the Resources section. As well as the featured full-length plays, Early Modern English Drama includes play entries, or individual reference pages, for each of the 403 plays in our database. These entries provide information on a play’s first printing, its first performance, and the people who made both possible. Searchable fields are linked throughout the play entries so that information can be easily explored, with the capability to yield new insights to suit your research needs. For instance, try clicking on the acting company on any page to see what other plays they debuted, or on the date of first publication to see which other plays were first printed that year. This information is searchable—try the basic search on our home page or the Advanced Search. In these ways, the play entries collectively offer a very different, and much broader, perspective on early modern theater in London than one gets from reading any single play or studying any single author. Here’s an example of a play entry. For further explanation of the different fields seen here, or for further tips on searching and browsing, please refer to the User Guide. Play entry page for Dido, Queen of Carthage. Yes, we do! We’ve assembled several lesson plans and syllabi for undergraduate and graduate classes. Please consult the Teaching page of the Resources section. We would also be delighted to learn from you about how you are using EMED in your work. Please share your ideas with us. There are several ways to download texts. On the Featured Plays page, you can download the XML and HTML files for each play for original spelling and regularized spelling and also download the regularized spelling as a PDF. On the play entries for the same plays, you can download the original spelling and regularized spelling PDFs from the Versions bar at left. You can also curate a collection for download via the Corpus Search page. EMED includes digital facsimiles of full plays from the Folger Shakespeare Library, so that you can see them as they first appeared in print. Look for the Facsimiles page in the Resources section. EMED lists many resources on performance history, the study of how plays were staged. You can find descriptive links to many online resources, including Folger projects and those at other institutions, in the Performance page of the Resources section, as well as other digital content, including a Folger lecture on ballads in Shakespeare’s plays. On the Editing page of the Resources section, you can find out where our texts come from, exploring the migration of text from digitized image to basic transcription to a variety of encoded files. As well as detailing the history of EMED texts and our relationship with other projects like Early English Books Online (EEBO), the EEBO-Text Creation Partnership (EEBO-TCP), and the Shakespeare His Contemporaries (SHC) project, this section also gives information on our editorial practices.